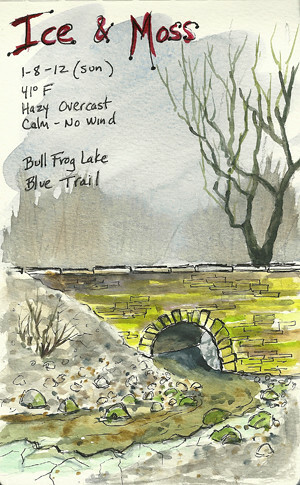 Blue Trail Bridge at Bullfrog Sketch – Let's Paint Nature! 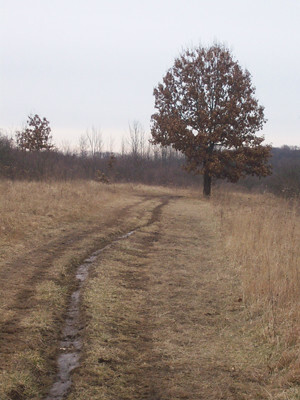 Come hike with me on the blue trail at Bullfrog Lake! There, now you’re hiking with me! It is very calm. There is no wind and the trees are mute. Can you see the peach color in the sky just above the horizon? I LOVE that! Blue grey above us, but peach in the horizon. It doesn’t smell like January outside. It smells just like March, when winter hangs on but the thaw of spring is in the air. 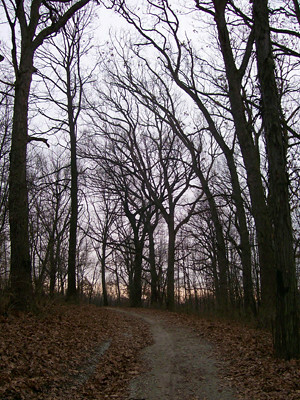 It is so mild (41°F) that the trail is covered in mud. Does that mean we should stay off? NO! We put our waterproof hiking boots on and prepare to GET DIRTY! 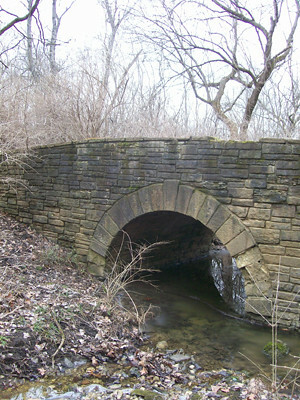 I stop by the bridge and walk down to the water. Only when the nearby cars from Archer Ave stop, you can hear the tiniest trickle from the creek. Ice fills the creek and bright green moss covers the rocks. The sound is small, but the peace is grand. Chickadees are out in full force. They warn each other of my approach. The call sounds something like this: Chick-a-dee-dee-dee-dee-dee-dee-dee-dee-dee. The more “dee’s” you hear the stronger the warning. Don’t worry little chickadees, I mean no harm. I hope you enjoyed our hike at Bullfrog Lake on the Blue Trail. If you cannot hike on your own for health reasons or such, just turn up your volume, listen to the sound of hiking on the trail, and look at the trail photos. Soon you will feel like you are out in nature! Pretty cool! Thank you..Enjoyed the hike! I am so happy to have you on my hike! Nice sketch and description of the hike. We are warmer here–some of my daffodils are coming up! But, things might change tomorrow when I expect cold rain to come in. Wow daffodils in January! I hope they are not damaged by future cold.